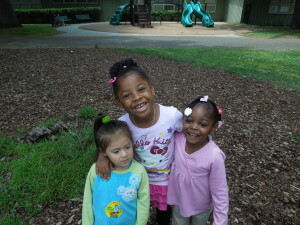 Will my 5 year-old Micalynn (middle) and her friends know someone who has been shot by the time they’re teenagers? By Michael Holland, Oakland Voices 2012. I decided to do my own survey. A “man-on-the-street” sample. No margin of error, no questionnaires, no statistics. Just one simple question that gets right at the heart of some pain going on in The Town right now. I asked almost fifty East Oakland youths from the ages of 13 to 17,”Do you know anybody personally that has been shot?” Most of them didn’t want to talk about it. At least, not to me. But, ten teens did speak up. The results were interesting. First off, I’m in East Oakland, so the majority of the population is Black or Hispanic. Although I had originally planned to ask 100 teens, only 10 were willing to even speak to this random community corespondent. The first participants were two Hispanic male teens standing at the bus stop on the corner of Seminary Road and International Blvd. They both had on red caps and red Nike shoes. Being Hispanic and wearing a lot of red can easily be read as you showing your allegiance to The Northern Structure, but these two young men didn’t look like gang members. When I asked my survey question, the taller of the two spoke. “My brother got shot in San Jose. He didn’t die.” The other young man added another name. “Gabriel Martinez – the 5 year old that got shot and killed by the taco truck earlier this year – was my cousin.” Both of the young men were 16 years old. They all began to laugh, as though something was funny about Keevon being shot. I never did figure out what was amusing about Keevon catching a bullet. Maybe he walks funny now. Or maybe it’s that guns are treated so casually that getting shot today is like when we got chased by the neighbor’s dog when we ran through his yard as kids. The slow one always got chomped in the backside. That was funny. For me, I don’t think a bullet ever will be. As they chuckled, a group of three young Black girls exited the cigarette store two doors down from the barber shop. I asked the group of girls if they knew anyone who had been shot. One of them chimed in and said that her 18 year-old boyfriend Charles Willis was shot on International and 82nd Ave. The other two nodded their heads in agreement. The girls did not wish to give their ages, but they could not have been any older than 16 years old. The girlfriend’s voice rang with what sounded almost like pride as she described how the Willis didn’t cooperate with OPD, even though he knew the shooter. Inside Hamilton’s Barber Shop, two Black 17 year-old boys were waiting for their turns at the barber’s chair. Again, I surveyed. But my answer this time was a wordless one. Instead, one of the young men simply rolled up his shirt sleeve to reveal a memorial tattoo on his forearm. Both teens went to school and grew up with Jabari, who was shot in Richmond following a high school basketball game last year. They are going to be seniors at Fremont High this year. Jabari was set to graduate this year. The youngster’s tattoo looked freshly done. Twenty years ago, an RIP tattoo on a 17 year old’s arm would have been frowned upon. But we are living in a time where the average teenager is exposed to as much violence as a John Singleton movie. The teens that didn’t participate in my survey chose not to speak to a stranger. You can’t fault them for that. Had they participated the results might have been even more revealing. Maybe they all too would have personal relationships with shooting victims. As of July 26th, there were 65 gun-related killings in Oakland. All of the teens I spoke to answered yes. That is only a micro-microcosm of the bigger picture. The fact that they all knew someone on the business end of a bullet is disturbing. Its sad that a lot of youth under the age of 18 can most definetely name a person they knew or knew of that has been shot. At only 15 I could have named a couple of people I knew that lost their lives to a bullet. At 17 gun violence hit home when two of my immediate family members were shot. I’m 23 now. Thank God they are alive right now. People are being shot so often, I can honestly say its normal to me to find out that someone I know around my age has been shot. I think a lot of youth and young adults almost think its cool to take a bullet and survive, they have bragging rights. Its only when someone close to you loses their life to a bullet that things get real. Wonderful project you did. Very insightful for those who have no clue. Its a horrible reality to face that shootings are pretty much normal in Oakland. At this point, its no longer shocking.